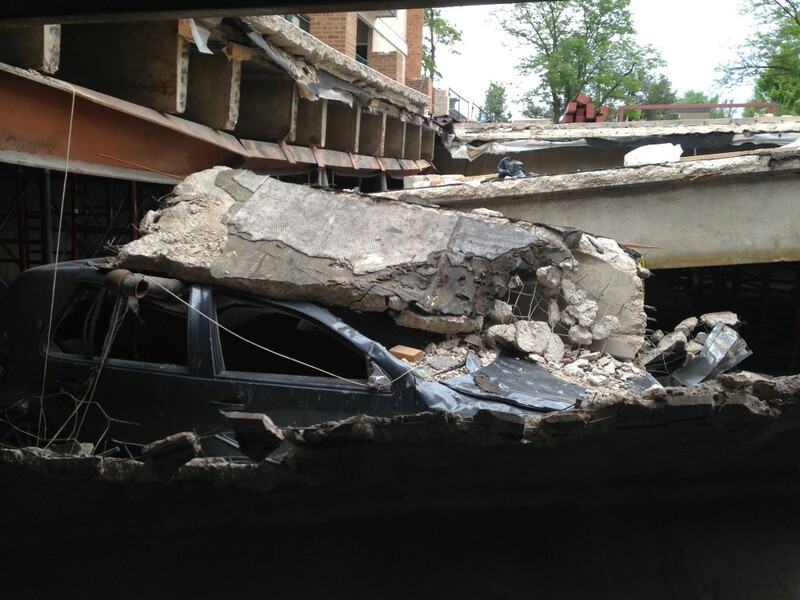 A concrete column fell into critical condition when a precast parking garage developed potentially compromising structural damage during construction. Several columns interior to the structure showed signs of stress and concrete spalling due to a flaw in the construction process. Damage was sustained when the pressure of bearing weight forced a grouted baseplate through concrete column causing significant spalling and undermining the structural integrity of the garage. 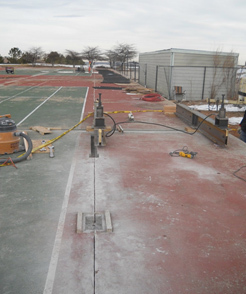 Immediate construction safety measures were implemented in the form of steel clamps supporting the cracked and rapidly deteriorating column prior to our crews arriving on site. 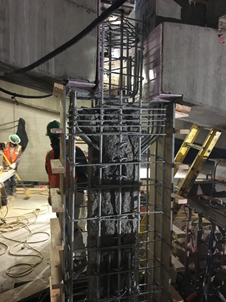 Our project managers worked with structural repair engineers to develop an initial stabilization of the column and a definitive repair solution. to permanently repair the parking garage’s original design intent. The repair sequence requires airlifting via hydraulic crane, in a prefabricated replacement column to set the structures’ exact alignment. The cranes reach is approximately 180 feet to the radial center and is capable of lifting 500 tons. Crews on site guide the replacement column into alignment before bonding into place. 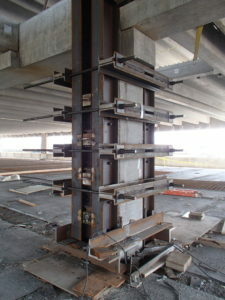 Replacing the column requires a shoring and jacking scheme to support the upper and lower levels of the parking garage. 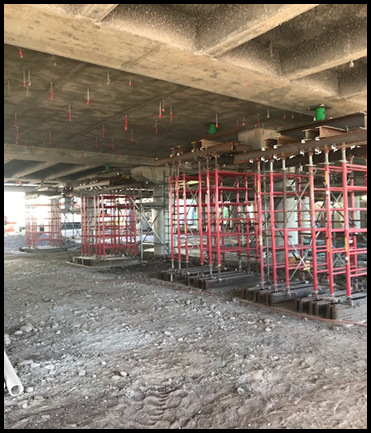 Shoring and jacking scheme is repeated as necessary throughout the rest of the garage, to distribute structural weight safely during the concrete column replacement process. Restruction Corporation’s project managers held regular intensive safety meetings to guarantee the highest standards of safety and to mitigate any potentially compromising situation. The next step in the repair process is to core in the columns above and below to install 6” by 6” and 4” by 4” solid steel lugs to support the steel shoring framework that is designed by the structural repair engineers for the renovated column. 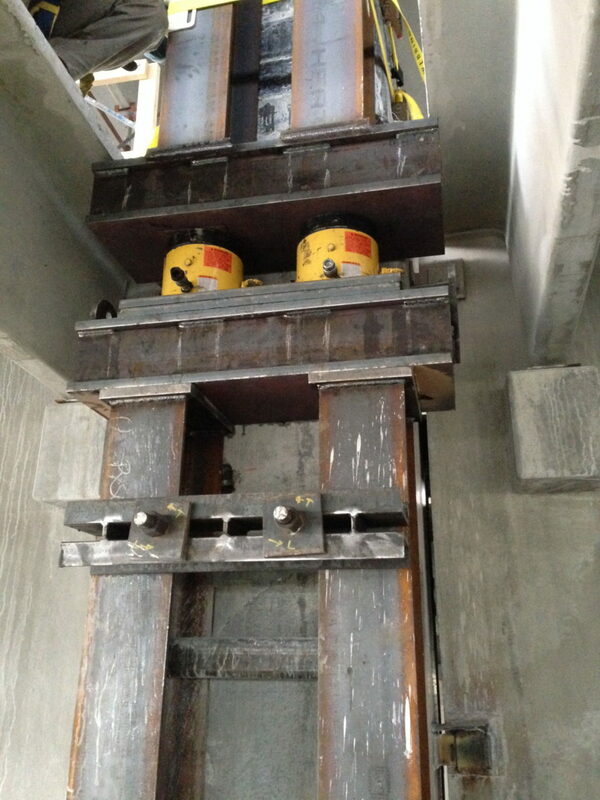 After the coring process is completed, the steel lugs are grouted into the existing column using a proprietary industrial aggregate and the prefabricated column is positioned onto the lugs via hydraulic crane. 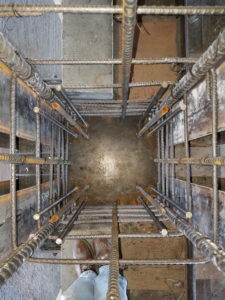 The rebar cage is secured to the reinforcing lugs by welding and bracing. We ensure all of our weld seals through our extensive weld certification testing able to withstand the structural stress of the parking garage. Four 200 ton hydraulic jacks lifted and relieved pressure off of the damaged concrete column. The structural shoring redistributed the concentrated load from the existing concrete column at the damaged area into the steel shoring and back into the concrete column at the lug supports allowing for the column to be replaced while ensuring structural integrity would not be compromised. 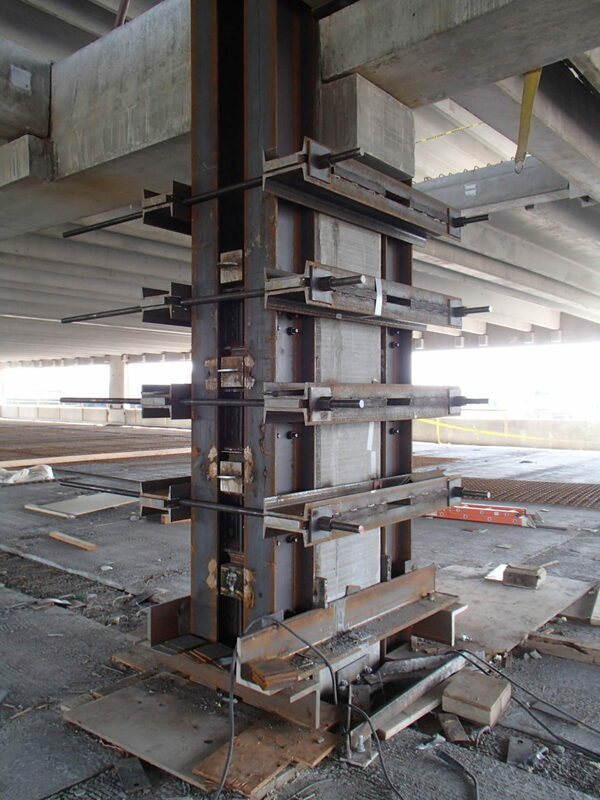 We repair the bonds to the columns and the decks to stabilize the new concrete column to accommodate the structural load of vehicles and the dead load of the upper levels. 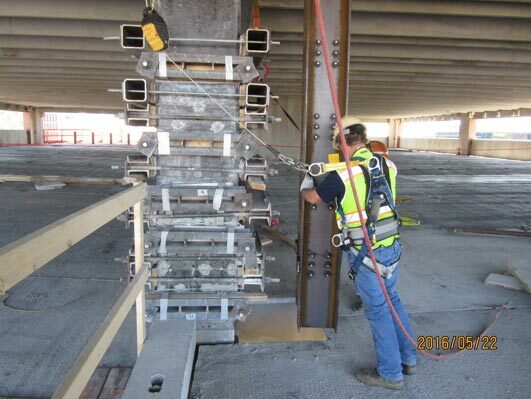 The final step in the repair process is to remove the clamps and solidify and repair the existing concrete columns damaged areas by pouring mortar into the rebar cages for proper weight distribution into the new column. 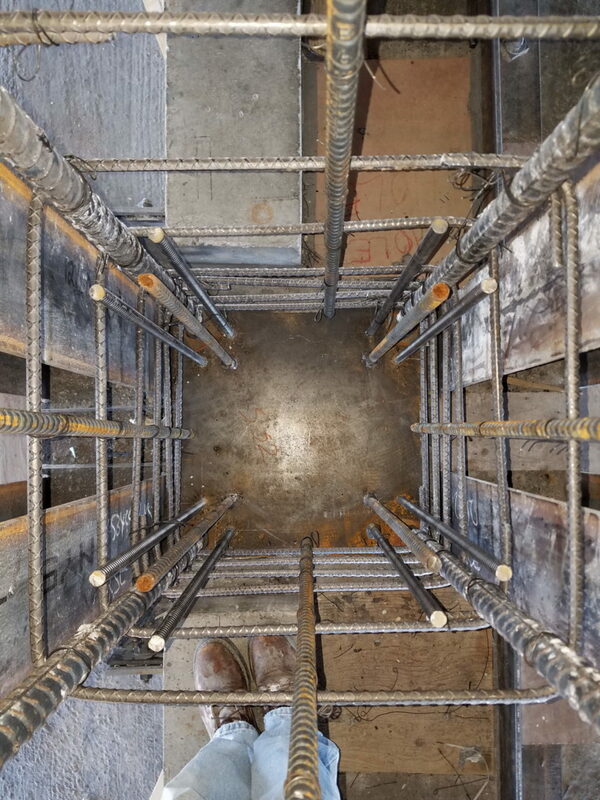 The rebar cages designed by the original structural engineer provides a guide for new concrete to be cast in place. After abrasive blasting is conducted to prepare the columns above, new mortar is cast into the column. Our engineers certify the effectiveness of concrete column repair through extensive field proofing of the load bearing capacity of the column. 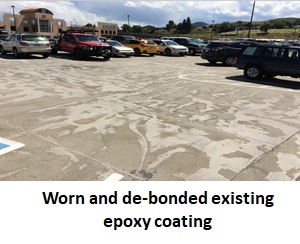 The repairs are completed in a timely manner and allowed construction of the parking garage to continue unrestricted.